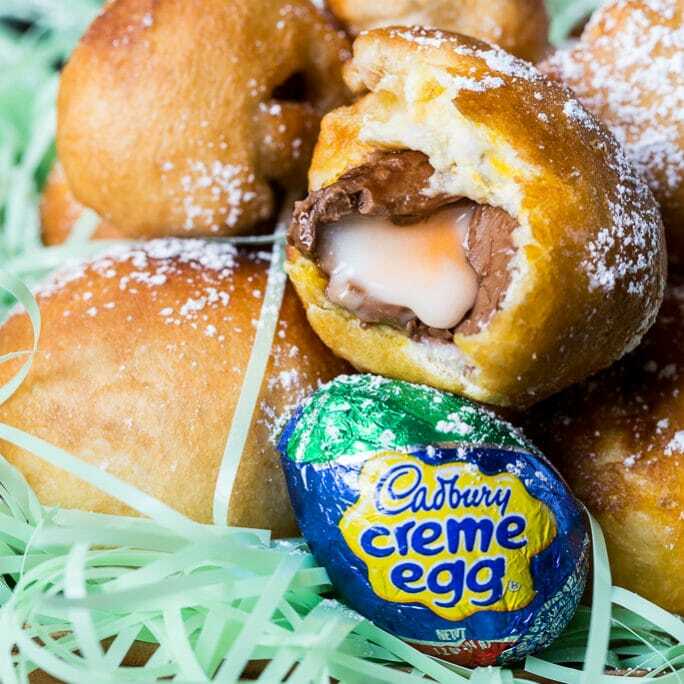 If you didn’t think a Cadbury Creme Egg could get any better – it can. 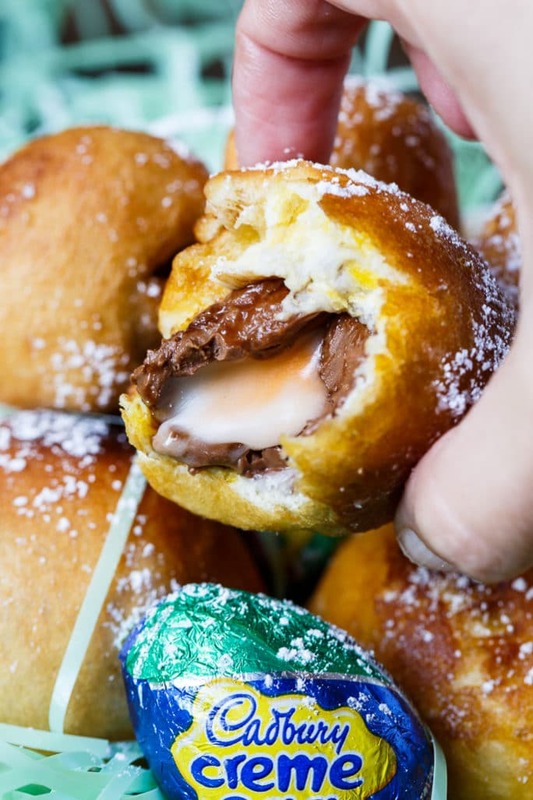 Deep-fried Cadbury Creme Eggs are so amazingly delicious. 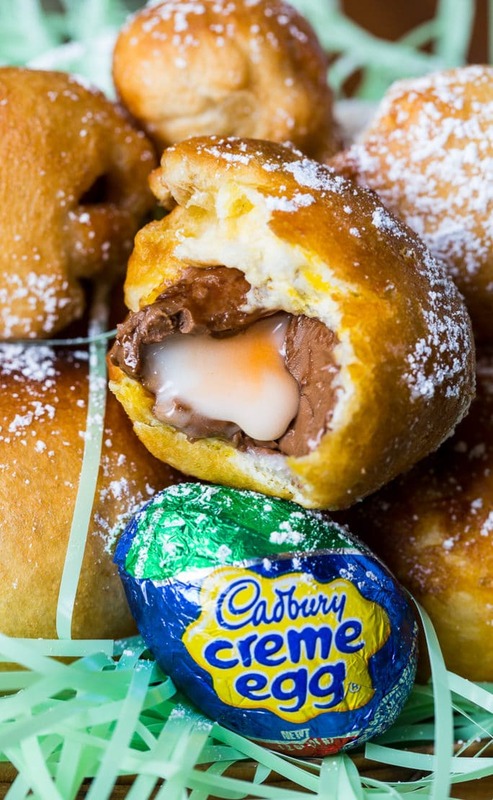 On the exterior is a golden fried coating of dough with a super gooey and warm Cadbury Creme Egg oozing out of the center. 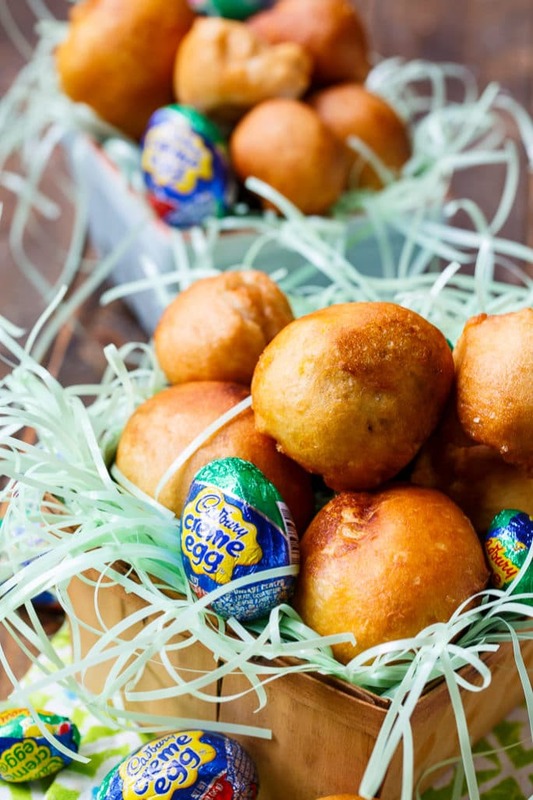 These Deep Fried Cadbury Creme Eggs are seriously my favorite deep-fried candy of all time. And I have deep-fried a lot of things, including Reese’s Peanut Butter Cups and Cookie Dough. Instead of using a batter like I did with peanut butter cups, I used refrigerated biscuit dough and pizza dough to wrap them in. I thought there would be a clear taste winner between the two, but they tasted very similar. With both the pizza dough and the biscuit dough, you have to make sure you do not underfry them. Even once they turn golden brown, fry them a little longer or the interior dough will still be doughy, especially with the biscuit dough. I also fried up both mini Cadbury Creme Eggs and the regular size. The mini ones were much easier to eat because they are bite-sized. Pour about 2 inches of oil in a Dutch oven and heat to 360 degrees. If using pizza dough, cut into squares that are just large enough to wrap around eggs. Wrap each egg, completely sealing the dough. If using biscuits, separate each biscuit into 2 pieces by peeling apart the layers. Wrap each piece around an egg, completely sealing the dough. 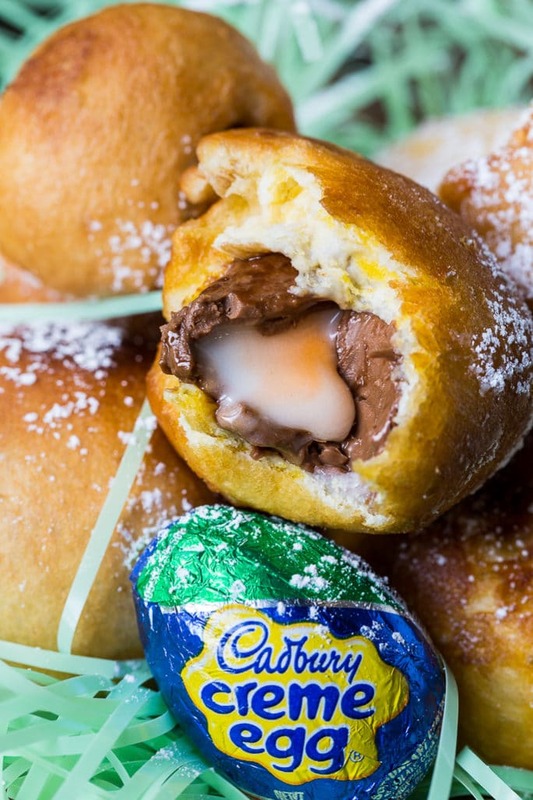 If using the biscuit dough with the mini eggs, cut each of the layers in half. Preheat oven to 200 degrees and set a rack inside a baking sheet. Drop 3 or 4 eggs in the oil and fry until golden brown on all sides, about 3 minutes. You may want to check one and make sure the dough has cooked all the way through. Remove to rack with a slotted spoon and keep warm in the oven until ready to serve. 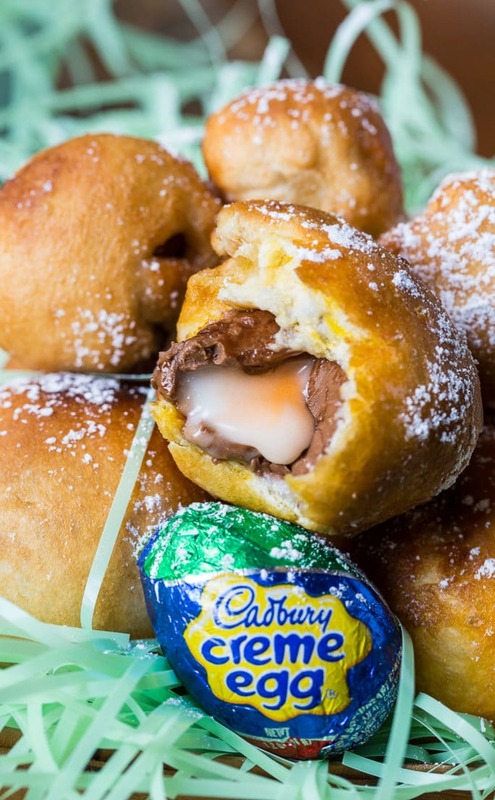 This entry was posted in Desserts, Other Desserts and tagged deep fried, Easter. Bookmark the permalink. Have you ever tried these goodies with phyllo dough or pastry sheets? I wonder if they would be equally delicious. Let us know if you try them. I think I will find the eggs and try to do this. I have not tried that Toni. Will do it when I find time.